In the not too distant future, flooding and coastal erosion have ravaged many parts of the UK, and scores of towns and cities have been destroyed. Despite the warning signs, the rallies and petitions, the problem has been largely ignored. Now the country is in a state of emergency. that will lead them from camp to camp, forced into a reality of hunger and uncertainty. With a growing population of desperate migrants, border control is strict, but as the veneer of civilisation begins to slip, Sam is faced with the dangerous decision to flee. The Castaways is a piece of theatre that was initially written and showcased as part of a Script Yorkshire new writing project in association with Wildgoose Theatre in York in autumn 2017. It was commissioned by Migration Matters Festival in Sheffield to be part of their June 2018 programme and was part of York Theatre Royal’s 2018 Visionari Festival. The play works to develop the audience's understanding of migration and encourage community cohesion by shedding new light on the refugee crisis. 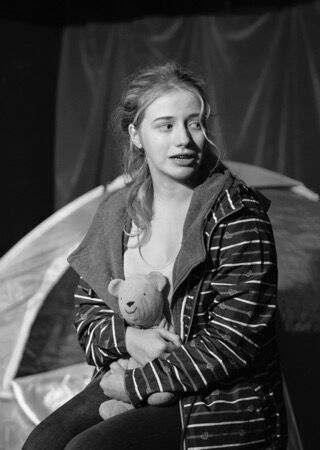 By putting a recognisable and relatable character of British descent into the shoes of a displaced migrant, the story conjures up the prospect of 'that could be me' for its audience members. By 'bringing the crisis home' in such a way, the piece aims to challenge negative opinions held towards asylum seekers and refugees, and encourages its audience to respect and interact with others in their own modern communities. Suitable for 14+ audience, The Castaways lasts approximately 40 minutes in its current format. Available for public performances the production is suited to an evening or weekend programming slot, as well as being suitable for school performances. You can download our venue pack to find out more. We also offer bespoke workshops to school audiences. You can find out more about our work with schools by downloading our education pack for The Castaways. If you would like to discuss bringing the production to your area, please contact us and we will be happy to discuss this with you. Technical specifications - The Castaways is a small-scale show that is suited to a studio space. A minimum of 3m x 3m performance space is required. We require a technician to operate the sound and very simple lighting during the show. A general wash focused onto the stage area is all that is required.